Notwithstanding their importance for domestic and regional affairs, Syria's intelligence services remain understudied. Although studies of Syrian politics often refer to the intelligence services, there have been few systematic attempts to study their development and role.6 This article is an attempt to fill that gap by outlining the origins and development of the Syrian services as well as providing insight into their use of covert action and terrorism. This study aims to make contributions to the separate but related fields of intelligence studies and authoritarian politics. The academic study of intelligence has taken off in the West over the past decade and a half, with the majority of research focusing on Western services, primarily British and American. Significant work has also been done on other Western services, such as Canada and Australia, while studies of the former Soviet Union's intelligence apparatus have also appeared in growing numbers. A limited amount of work has been done on intelligence in other parts of the world but comparative intelligence studies is still lacking in breadth. Studies on Chinese services have now begun to emerge and Israel has been well covered, if often in a rather unacademic fashion.7 Aside from these areas, though, intelligence studies has virtually passed by the developing world.8 This lacuna is nowhere more glaring than in relation to the Arab world.9 The Arab states have often only entered into intelligence studies in two ways. First, they have been examined as victims of Western covert action in studies of the activities of Western intelligence services in the Third World.10 Second, they have been portrayed as perpetrators of "state-sponsored terrorism. "11 These approaches, while touching on important topics, do not give comprehensive accounts of the evolution and roles of national services. Such accounts are necessary if comparative intelligence studies is to broaden its scope. The problem faced by researchers in all branches of intelligence studies is the dearth of verifiable information. Nonetheless, writers on Western services and even on the former Soviet Union have been able to use official archives and interviews to make significant progress. The problem is more acute in relation to the developing world. In the few countries where official archives exist they are rarely open to local researchers, let alone outsiders. Material in any way connected with security or intelligence, or even with modern politics, is usually out of bounds. Interviews can be used to a limited extent, but can prove even more unreliable than in the Western context.19 These problems have tended to deter researchers, but they need not prevent work being carried out since much elementary empirical work is waiting to be done. There is a need for studies of the history, organizational structures, operations and political and military roles of Arab intelligence services. This article uses two different approaches to indicate the sort of work that is possible on a relatively closed Arab state, in this case Syria. The first part provides an overview of the history and development of Syria's intelligence services assembled from a combination of secondary sources and easily available primary sources. This indicates what can be learnt from the interpretation of readily available sources. The second part is a study of covert and paramilitary action during the 1960-61 confrontation between Syria and Jordan. This study relies mainly on Western archival and regional press sources. It demonstrates what can be learned about the normally subterranean workings of Arab intelligence services by analysis of the occasional high visibility events. As a consequence of the French Mandate that created the modern Syrian state, the country's intelligence services owe much to the French "template" which shaped their early development. The influence of the French model is most striking in the long-standing primacy of military intelligence, known until 1969 as the Deuxième Bureau. Although both Egypt and the former Soviet Union, along with the East Bloc satellite states, had at times intimate ties with the Syrian intelligence apparatus, they had only limited impact on its structures and organizational development. Syria's intelligence services were established by the French Mandatory authority. Before independence in 1945, external intelligence matters were handled by the services of Metropolitan France. The French-officered services in Syria were only responsible for internal security and counter-espionage.20 After independence the mission of these services gradually expanded to include targeting exile and opposition groups in Lebanon, and intelligence gathering efforts against Israel. Lebanon was the scene of numerous operations against political exiles and opponents.21 The Israel section ran spy rings and fedayeen paramilitary/terrorist operations in northern Israel from bases in Qunaytra and south Lebanon. Institutionally, the dominant role of the Army in politics was reflected in the rise of the Deuxième Bureau, the intelligence branch of the Army General Staff, at the expense of the civilian Department of General Security (Sûreté Générale).22 The tenure of 'Abd al-Hamid Sarraj as head of the Deuxième Bureau, which lasted from 1955 to 1958, exemplified these trends. His officers became increasingly active in both Lebanon and northern Israel. At the same time as directing these activities, Sarraj built up both his own power and that of the Deuxième Bureau at home. The Sûreté became no more than an executive arm of the Deuxième Bureau. It was also at this time that Yasser Arafat's Palestinian guerrilla group Fatah assumed a heightened role. In the early days this group was a tool of the Deuxième Bureau.34 The Bureau's Director, Colonel Ahmad Suwaidini, saw Arafat's group as fitting in with his strategy of popular revolutionary war against Israel. Since Fatah had no men of its own at this stage, they were given the opportunity to employ members of the fedayeen unit created in the 1950s.35 The intimate relationship between Fatah and the Deuxième Bureau is indicated by the fact that Fatah's first successful attack on 31 December 1964, was carried out against the Israeli National Water Carrier, an installation that had long been the target of Syrian diplomatic protests and military attacks.36 The only restriction on their activities was that attacks had to be launched from Lebanon and Jordan, rather than directly from Syrian territory. Although Israel did retaliate against Syrian targets,37 most Israeli reprisals were instead conducted against alleged guerrilla bases in Lebanon and Jordan. After the February 1966 coup within the Ba'th Party, Salah Jadid emerged as the leader of Syria's most radical regime to date. Eager to establish his extremist credentials and to hit back at his many enemies, Jadid centralized control of all intelligence and security services under Colonel 'Abd al-Karim al-Jundi.38 His support for Jadid was so crucial that when Jundi died in March 1969, it was only a matter of time before Jadid fell. These institutions have increasingly turned their attention to foreign policy. In Lebanon, Military Intelligence (MI) has emerged as the dominant institution. The use of terrorism, especially by MI and Air Force Intelligence, is well documented.48 To take a few incidents from just one year, in 1983 Jordanian embassy officials were attacked in Spain, Greece, Italy and India. Two were killed and five wounded. Palestine Liberation Organization (PLO) officials were attacked in Greece and Portugal, resulting in two dead and three wounded. Other bomb attacks in Israel, Turkey and Jordan injured twelve people. Such methods became the primary ones of Syrian foreign policy in this period. The regime was encouraged to use them by their evident success. Through the use of terrorism Asad was able to rid himself of political opponents, drive Israel and the US out of Lebanon, and bring both Jordan's King Hussein and PLO Chairman Yasser Arafat into line on a number of crucial occasions. A central theme emerges from this historical account. Since 1948, the military has been the arena of politics within which the struggle for power has been conducted.49 However, while regular army units have been used in the various coups and coup attempts, the most effective instruments have been the intelligence and security services. This was exemplified by the power struggle between Asad and Jadid. In March 1969, Rifa't Asad (Asad's younger brother) used his paramilitary units, in conjunction with Military Intelligence, to crush Jundi's security force. It was this that ultimately decided the struggle between Asad and Jadid.50 Control of these services has been vital for all of the players in recent Syrian politics. In the process of acquiring this central political role, these agencies have acquired tremendous power. The term "mukhabarat state" is often used rather loosely in relation to the contemporary Arab world to refer to the nature of authoritarian state power in much of the region. Asad's Syria provides a prime example of such a state. From independence until the mid-1960s, the intelligence services were an essential element in the struggle for power. In particular, control of the Deuxième Bureau was highly prized as it enabled the faction that controlled it to persecute its opponents with the full panoply of summary arrests and military tribunals.51 Under Asad, the regime has consolidated its grip on the intelligence services and they have come to dominate all other political and military institutions, including the state itself. They now play a leading role in both the making and execution of Syrian domestic and foreign policy. Presidential Security Council. The Council's chairman is Asad's intelligence "supremo," who is responsible for supervising the other agencies and for resolving interservice disputes. The two men who have held this post have been Air Force officers and long-time confidants of the president. General Naji Jamil held the post from 1971 to 1978. The current incumbent is Brigadier Muhammad al-Khuwali. The Council also controls small intelligence and security organizations of its own, such as the Foreign Liaison Office, which monitors the activities of foreign diplomats in Damascus. General Intelligence Directorate (GID). This is the current incarnation of civil intelligence. It was established in its present form in 1971. It controls the civil police, the border guards, and has primary responsibility for maintaining surveillance over the Ba'th Party, the civilian bureaucracy and the general populace. Adnan Babagh was its first director. His successor, Ali Hadani, was in office during the mid 1970s. Fu'ad Absi was the director in 1983. The recently dismissed Majid Sa'id took over the post in early 1987. Political Security Directorate (PSD). The PSD is the branch of the GID that handles political intelligence and security, as opposed to criminal and civil policing. In the early eighties it was headed by Ahmad Sa'id Salih and from 1987 until recently by Adnan Badr Hassan. It is divided into the Internal Security Department and the External Security Department (ESD). The former was headed until recently by Muhammad Nassif. The ESD appears to be divided into three units, Arab Affairs, Refugee Affairs and Zionist and Jewish Affairs. 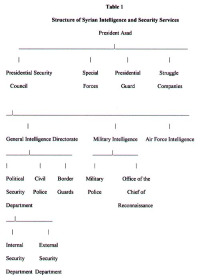 Military Intelligence (MI). The Deuxième Bureau that preceded MI was a powerful political actor. MI, established in 1969, is now probably the dominant intelligence agency in Syria. In Lebanon, MI under Ghazi Kanaan appears to control not only the military and security situation but also Syrian political policy. MI controls the Military Police, who provide security for elements of the ruling elite, and the Office of the Chief of Reconnaissance, which is probably responsible for strategic and tactical military intelligence collection, collation and analysis. MI's main role is to ensure the loyalty of the military. It is also responsible for carrying out unconventional warfare operations. In 1969 Colonel Ali Zaza was appointed as director but he was replaced in 1971 by Colonel Shehabi. General Bitar took over in 1973, but was replaced the same year by Brigadier 'Ali Douba. Air Force Intelligence (AFI). This agency is the closest to Asad. Brigadier al-Khuwali served as its director from 1963 until 1987. He was moved from the post after court cases linked him to terrorist operations in Britain and West Germany. The current director, Colonel Ibrahim Houwaji, is al-Khuwali's nephew. Naji Jamil filled the dual roles of Air Force commander and Presidential Security Council director from 1971 until 1978. Khuwali was director of AFI. By 1977 the latter was also the President's Personal Assistant for Intelligence and Security, in charge of the security arrangements for official functions. He subsequently moved on to combine the posts of AFI Director and intelligence supremo. The organization's primary roles are to ensure the loyalty of the Air Force, to provide physical security for official functions and to carry out certain overseas operations. Special Forces (SF). Formed in the 1970s, this elite army unit has between 10,000 and 15,000 personnel and is equipped with heavy armaments. It has seen action against both the Muslim Brotherhood internally and the Israelis in Lebanon. Presidential Guard (PG). Established in 1976, the 10,000 strong Guard is commanded by Adnan Makhlouf, the cousin of Asad's wife. Its role is to guard the Presidential Palace and central Damascus. Struggle Companies. This small paramilitary unit is commanded by Adnan al-Asad, the President's cousin. Other units. Virtually every prominent personality in the regime has some sort of personal security unit. This may consist of a handful of bodyguards, or may be an extensive intelligence apparatus. Most of these small units are only responsible for the security of their leader's personal fiefdom. The proclivity of Syria's intelligence services for engaging in political violence has been touched on in the literature,56 which deals primarily with anti-Western/Israeli operations. However, there is a rich vein of material on inter-Arab operations which has been mined inadequately. The advantage of this area of study is that paramilitary action is often the point at which clandestine activities become public. Therefore, by concentrating on this topic, researchers can learn much about the functioning of states' intelligence services more generally. Although covert action and terrorist operations are by definition hard to document, it is possible to use Western archives to shed some light on these affairs. The study presented here is an examination of the covert battle that erupted between Syrian and Jordanian intelligence from March 1960 to March 1961. The formation of the United Arab Republic in February 1958 posed an immediate threat to Jordan, since Nasser's intelligence services were now able to work through the Syrians. During 1958 Syrian and Egyptian agents sought to stir up the pro-Nasserist opposition in Jordan; they distributed subversive literature and smuggled arms into the country.58 Syrian and Egyptian agents also carried out a series of bomb attacks. In the wake of the Iraqi Revolution in July 1958, however, Britain rushed troops to Jordan and the US increased its logistical support. As a result, King Hussein was able to counter the subversive threat and to bring the domestic opposition under firm control. During much of 1958 and in early 1959 the intelligence services of the UAR, and especially their Syrian elements, were kept busy controlling domestic dissent, prosecuting a large-scale covert war in Lebanon, and countering the activities of the revolutionary Iraqi regime under 'Abd al-Karim Qasim.59 Nonetheless, Sarraj had not forgotten his feud with the Jordanian monarchy, whom he regarded as reactionary puppets of the imperialist West. Sarraj struck back, but now that there was no longer a vibrant indigenous opposition movement to support he changed tactics. His agents sought to strike at the heart of the monarchy by targeting the King and his ministers directly. Other abortive plots came to light in the ensuing months. In August a member of Hussein's personal entourage was convicted of attempting to kill the King by planting acid in his sinus drops. The man admitted that he had been suborned by an official of the UAR Embassy. Also in August a palace cook who had planned to poison the King confessed to having been put up to the task by Syrian intelligence.63 However, it was only at the end of the month that Sarraj's efforts bore fruit. The British had meanwhile been doing their best to restrain the Jordanians. Judging that any "disturbances in Syria are likely to be extremely amateurish in execution," and that the RJAF could not match the UAR's Air Force, the British concluded that "Jordan would have no hope of avoiding ultimate defeat" and may be "heading for a fiasco." Johnston sought to convince Hussein that UAR propaganda and terrorism were designed to make him lose his nerve and do something rash. Eventually, the British warnings undermined Jordanian resolution and the military situation de-escalated.78 Nonetheless, Hussein and his advisers were not willing to let Nasser and Sarraj get away with their provocation. Jordan sought to pay them back in their own medicine. Colonel Ghazi al-Khatib, the Jordanian Military Attaché in Beirut, was to be the operations officer for a covert campaign probably coordinated by the King's uncle, Sharif Nasir.79 Khatib took up contact with Salah Shishakli, who was active in anti-UAR intrigue and who had brought together other Syrian exiles including Hisham Barazi.80 Khatib arranged to supply Shishakli with money and arms to hit back at the Syrian regime. A Lebanese communist and ex-minister, Muhammad al-Fadl, was the group's Lebanese patron. Some Syrian exiles were trained in Jordan in a "Camp Shishakli," which the Syrian press dubbed a school for "terrorism, sabotage and murder. "81 Other Syrians were recruited in Lebanon and offered money in return for placing bombs in Damascus. By September the group's 300-odd agents were ready for action. On 10 September the UAR Consulate in Beirut was bombed. Subsequently, several newspapers in Beirut were also hit. On 25 October bombs went off in central Damascus outside the Hijaz railway station, the post and telegraph office and the old municipality building. These explosions were timed to coincide with visits by Nasser and the Afghan King to Damascus and so cause maximum embarrassment to the UAR. In another incident Syrian security officers apprehended two truck-loads of explosives at the Jordan border which, it appeared, had been intended for detonation among the Damascene crowds during a rally to welcome Nasser. Two men were subsequently apprehended and admitted they had been promised 1,000 dinars and appointments as sergeants in the Jordanian Army if they agreed to let off bombs in Suwayda' during Nasser's visit. On 9 November a large explosive device was discovered and disarmed on the Damascus-Beirut railway line. In mid-November a Lebanese was arrested in Damascus while planting explosives. Later in the month a Jordanian agent on a mission to organize terrorist attacks was also apprehended. Damascus charged Lebanon with harboring these subversives. Lebanon responded to Syrian complaints and cracked down on the group. Salah Shishakli's house was raided. Although Shishakli got away, an ex-Syrian officer, Muhammad Munir Armanazi, was arrested and a cache of weapons and false identification documents was found. Warrants were issued for the arrest of Shishakli, Barazi and their accomplices. On 21 November Khatib was expelled from Lebanon. He returned to Amman, where he was rewarded by being appointed aide-de-camp to the King. Meanwhile, Fadl and the other Lebanese members of the group were put on trial. This was not, of course, the end of the secret war between the Jordanian and Syrian intelligence services. Violence was to re-erupt often in the following decades, especially after 1970, when Asad sought to keep Jordan in the anti-Israeli camp.87 Nonetheless, this brief account of an especially bitter episode in the struggle brings out a number of characteristics of Syrian covert operations. First, it highlights the use of terrorism as part of a coordinated political warfare strategy that sought to make it appear as if the violence was home-grown and that King Hussein faced widespread domestic discontent. Second, when this strategy lost credibility, Syria continued to employ indigenous proxies, such as Rimawi and Mutalq. This approach presaged the use of deniable Palestinian proxies from the late-1960s on. Third, Syria used terrorism to provoke an escalatory Jordanian counterattack that could have provided an excuse for a crushing conventional military blow. Lastly, it is clear that Jordan responded to Syrian terrorism in kind. Despite the tendency in the West to associate state-sponsored terrorism with "radical" regimes, such as Syria, in the turbulent Middle East even King Hussein has not hesitated to use the tool, his "respectable" image in the West notwithstanding. The second aim of this article has been to provide a detailed narrative of the use of covert and paramilitary action by Syria and Jordan during one of the numerous periods of tension that have marked the two countries' relationship. Studying this episode provides insights into the workings of the Syrian intelligence services and their operational practices, which otherwise would be unavailable. This narrative has demonstrated that it is possible to use Western archives and press sources to study such episodes. As noted in the introduction, the study of intelligence and covert action in the Arab world and in the developing world more broadly is in its infancy. The subject should nonetheless be of interest to intelligence specialists, area specialists and students of authoritarian politics. If this article encourages that interest it will have served its purpose. Andrew Rathmell is Lecturer at the Department of War Studies at King's College, London. 1. An earlier version of this paper was presented to the 1995 annual conference of the Political Studies Association. The author would like to thank all those present who commented and also to thank two anonymous referees for their invaluable suggestions. 2. Amos Perlmutter defines authoritarian praetorianism as one of military-civilian fusionist rule in which the ruling elite of officers, bureaucrats and technocrats "restrict political support and mobilization," and whose main "source of support . . . is the military establishment." Amos Perlmutter, The Military and Politics in Modern Times: On Professionals, Praetorians and Revolutionary Soldiers (New Haven, CT: Yale University Press, 1977), p. 95. 3. Such as the first and third army divisions. "New Man in Syria," Foreign Report, 9 October 1986. 4. C.A. Wege, "Assad's Legions: The Syrian Intelligence Services," International Journal of Intelligence and Counterintelligence, 4, no. 1 (Spring 1990), pp. 91-100. 5. The dominant role played by Syria's Military Intelligence chief in Beirut, Ghazi Kanaan, has for many years been an article of faith among Lebanese of all persuasions. "Syria: Gen Kanaan's Fall From Grace," Intelligence Newsletter, 13 September 1989. 6. Studies of modern Syrian politics frequently refer to the role of the military and mukhabarat as key props of the regime but do not go into detail. One of the best discussions of the "authoritarian-populist" nature of the Syrian regime is R.A. Hinnebusch, Authoritarian Power and State Formation in Ba'thist Syria: Army, Party and Peasant (Boulder, CO: Westview, 1990). Other general references to the security services include J.F. Devlin, Syria: Modern State in an Ancient Land (Boulder, CO: Westview, 1983), pp. 62-64; and E. Picard, "Arab Military Politics: From Revolutionary Plot to Authoritarian State," in A. Dawisha and I.W. Zartman, eds., Beyond Coercion: The Durability of the Arab State (London: Croom Helm, 1988), pp. 116-46. Human rights groups have included surveys of the intelligence services in their publications. Middle East Watch, Syria Unmasked: The Suppression of Human Rights by the Asad Regime (New Haven, CT: Yale University Press, 1991), and Amnesty International, Report to the Government of the Syrian Arab Republic (Washington DC: Amnesty International, 1983). 7. On China, see N. Eftimiades, Chinese Intelligence Operations (London: Frank Cass, 1994), and J. Richelson, Foreign Intelligence Organizations (Cambridge, MA: Ballinger, 1988). Richelson's book is also a good survey of a variety of intelligence organizations. Works on Israeli intelligence tend to be sensationalist. See, for instance, R. Deacon, The Israeli Secret Service (London: Hamish Hamilton, 1977); R. Payne, Mossad: Israel's Most Secret Service (London: Bantam Press, 1978); D. Eisenberg, U. Dan and E. Landau, The Mossad (New York: Paddington Press, 1978). A notable exception is I. Black and B. Morris, Israel's Secret Wars (London: Hamish Hamilton, 1991). Important material on Israel's intelligence services was released when the Iranian "students" who took over the US Embassy in Tehran in 1979 pieced together and published 79 volumes of shredded CIA files in a series entitled "Documents From the Nest of Spies." 8. For a discussion of the problems associated with studying intelligence in the developing world, see Adda Bozeman, "Political Intelligence in Non-Western Societies: Suggestions for Comparative Research," in Roy Godson, ed., Comparing Foreign Intelligence (London: Pergamon-Brassey, 1988), pp. 115-55. 9. There is only one book-length survey of Arab secret services in English: Y. Caroz, The Arab Secret Service (London: Corgi, 1978). Dale Eickelman's work on Oman's intelligence service provides a brief glimpse into a fascinating line of enquiry. See D. Eickelman, "Intelligence in an Arab State," in Godson, ed., Comparing Foreign Intelligence, pp. 89-114, and D. Eickelman and M.G. Dennison, "Arabizing the Omani Intelligence Services: Clash of Cultures?," International Journal of Intelligence and CounterIntelligence, 7, no. 1 (Spring 1994), pp. 1-28. Another useful study is W. Phares, "The Intelligence Services in Lebanon During the War of 1975-1990," International Journal of Intelligence and CounterIntelligence, 7, no. 3 (Fall 1994), pp. 363-81. 10. Topics of interest have included British plans to oust Nasser in the 1950s, Anglo-American coup attempts in Syria in the same period and French operations against Algerian nationalist leaders in the 1950s. Reference should also be made to the interest shown in the 1953 CIA/SIS-backed coup in Iran. A selection of references includes Richelson, Foreign Intelligence Organizations, pp. 26 and 163; C. Andrew, Secret Service: The Making of the British Intelligence Community (London: Heinemann, 1985), pp. 488-94; R. Aldrich, "Secret intelligence for a post-war world: reshaping the British intelligence community," in R. Aldrich, ed., British Intelligence, Strategy and the Cold War, 1945-51 (London: Routledge, 1992), pp. 15-49; J. Richelson, The U.S. Intelligence Community (Cambridge, MA: Ballinger, 1989), p. 344; J. Prados, Presidents' Secret Wars (New York: William Morrow, 1986), pp. 28-60; S. Ambrose, Ike's Spies: Eisenhower and the Espionage Establishment (Garden City, NY: Doubleday, 1981). On the activities in Syria, see A. Gorst and W. S. Lucas, "The Other Collusion: Operation Straggle and Anglo-American Intervention in Syria, 1955-56," Intelligence and National Security, 4, no. 3 (July 1989), pp. 576-95; D. Little, "Cold War and Covert Action: The United States and Syria 1945-1958," The Middle East Journal, 44, no. 1 (1990), pp. 51-75; D. Lesch, The United States and Syria, 1953-1957: The Cold War in the Middle East (Ph.D. diss., Harvard University, 1990); A. Rathmell, Secret War in the Middle East: The Covert Struggle for Syria 1949-1961 (London: I.B. Tauris, 1995). On the Iranian episode, see, for instance, M. de Moraes Ruehsen, "Operation 'Ajax' Revisited: Iran, 1953," Middle Eastern Studies, 29, no. 3 (1993), pp. 467-86. 11. This field of study took off in the 1980s, with particular attention being paid by Western writers to the Soviet Union, Cuba, North Korea, Syria, Libya and Iran as those primarily responsible for this sort of activity. Unfortunately, this debate became highly politicized, making much of the work produced of limited academic value. There is still room for good, empirically based work to be done on this topic and this should be easier now that the political spotlight has been removed from the field. For examples of the most prominent writings in this field, see Claire Sterling, The Terror Network (New York: Rinehart and Winston, 1981); R. Cline and Y. Alexander, Terrorism as State-Sponsored Covert Warfare (Fairfax, VA: Hero Books, 1986); E. Hermann, The 'Real' Terror Network (Boston, MA: South End Press, 1982). 12. Not just the Arab world of course. The Latin American "National Security States" have been the subject of a good deal of attention. See, for instance, D. Collier, ed., The New Authoritarianism in Latin America (Princeton, NJ: Princeton University Press, 1979); and E. Duff and J. McCamant, Violence and Repression in Latin America: A Quantitative and Historical Analysis (New York: Free Press, 1976). 13. Among the classic studies are S. Huntington, Political Order in Changing Societies (New Haven, CT: Yale University Press, 1968); S. Huntington and C. Moore, eds., Authoritarian Politics in Modern Society: The Dynamics of Established One-Party Systems (New York: Basic Books, 1970); A. Perlmutter, Egypt: The Praetorian State (New Brunswick, NJ: Transaction Books, 1974), and A. Perlmutter, Modern Authoritarianism: A Comparative Institutional Analysis (New Haven, CT: Yale University Press, 1981). Approaching the topic from a different angle, Stohl and Lopez have argued that social science has been too "antiseptic" and ignored the real nature and political role of state repression and terrorism. M. Stohl and G.A. Lopez, eds., The State as Terrorist: The Dynamics of Governmental Violence and Repression (London: Aldwych Press, 1984). 14. J. Crystal, "Authoritarianism and its Adversaries in the Arab World," World Politics, (January 1994), pp. 262-89. Impressionistic and journalistic assessments of Arab police states however abound. On Iraq alone, see S. al-Khalil, Republic of Fear (London: Hutchinson, 1989); K. Makiya, Cruelty and Silence (London: Jonathan Cape, 1993); and H. Sumaida with C. Jerome, Circle of Fear (Toronto: Stoddart, 1991). 15. These are what Nazih Ayubi refers to as "fierce" states. N. Ayubi, Over-stating the Arab State: Politics and Society in the Middle East (London: I.B. Tauris, 1995), p. 449. 16. The term is adapted from the title of a Middle East Watch report on Iraq's security services. Middle East Watch, Bureaucracy of Repression: The Iraqi Government in its Own Words (New York: Human Rights Watch, 1994). 17. Though some observers point optimistically to the growth of civil society which counteracts this trend. See the discussion in A. Richard Norton, ed., Civil Society in the Middle East (Leiden: E.J. Brill, 1995), vol. 1. See also the discussion in G. Salamé, ed., Democracy Without Democrats? : The Renewal of Politics in the Muslim World (London: I.B. Tauris, 1994). 18. The escalating confrontations between the security forces and opposition in these states have been widely reported in the general press as well as in specialist publications such as Middle East International and Gulf States Newsletter. Events can also be followed in the reports of human rights groups such as Amnesty International and Middle East Watch. 19. The work of scholars such as Amatzia Baram, writing on contemporary Iraq, demonstrates both the strengths and the limits of research into such topics in a closed society. See, for example, his chapter "The Iraqi Invasion of Kuwait: Decision-making in Baghdad," in A. Baram and B. Rubin, eds., Iraq's Road to War (London: Macmillan, 1994), pp. 5-36. 21. For instance, in May 1949 a crisis broke out between Damascus and Beirut after the Lebanese arrested a Syrian military intelligence officer and three soldiers sent on an assassination mission in Lebanon. "La Syrie ferme ses frontières avec le Liban," La Bourse Egyptienne, 19 May 1949; Public Records Office, Kew (hereafter PRO), Foreign Office (hereafter FO) 371/75536/E6848, Broadmead to FO, 2 June 1949; E9903, Houstoun-Boswell to FO, 9 August 1949. 22. This was responsible for countering subversion among the civilian population. It was nominally responsible to the Interior Minister but came to be staffed largely by soldiers. 23. Sarraj exploited his close ties with sympathetic senior politicians and the Egyptians to block the move. A.W. Dulles to Goodpaster, "Situation Report on Syria," 22 March 1957, Declassified Documents Reference System, 1981, 26 E; Lesch, The United States and Syria, 1953-1957: The Cold War in the Middle East, pp. 215-19. 24. A constant source of conflict was the army-officered but civilian-manned gendarmerie, control of which swung back and forth between the Interior Ministry and the Ministry of Defence. US National Archives and Records Administration, Record Group 59, 783.00/4-753. 25. K. Wheelock, Nasser's New Egypt (London: Stevens and Sons, 1960), pp. 231-32; PRO, FO 371/134383/VY1015/28, Scott to Rose, 19 March 1958. 26. A 1957 US intelligence report noted that each member of the Deuxième Bureau was issued with "a 'watch camera' . . ., a fountain pen revolver . . . and [an] arrow launcher . . . which can kill without noise at a distance of 75 meters." "Information on the Syrian Deuxieme Bureau," from US ARMA Beirut, 20 June 1957, DA Intelligence Report R-208-57. 27. Syrian covert action became so widespread that the Lebanese government lodged a complaint with the UN Security Council in June 1958. "Speech of Dr Malik before the UN Security Council," 6 June 1958, S/823, 823rd Meeting, Security Council Official Records, 1958, p. 4. Press reports and government documents alike confirm a massive covert Syrian intervention that included supplying arms to the opposition, training paramiliaries and using Syrian soldiers to carry out terrorist attacks. On the crisis in general, see F.I. Qubain, Crisis in Lebanon (Washington, DC: Middle East Instiute, 1961), pp. 71-168. For specific Syrian covert operations, see for instance, "Verhaftung eines Syrischen Terroristen," Neue Züricher Zeitung, 27 June 1958; "Le Deuxième Bureau Syrien aurait équipé et énvoye des sommes à Mouktara pour soutenir les insurgés de M. Joumblatt," L'Orient, 13 July 1958; PRO, FO 371/134133/VL1015/602, Scott to FO, 2 September 1958. 28. Egyptian propaganda, sponsorship of terrorism and support for a 1962 coup attempt pushed Damascus to call a special Arab League Summit in August 1962 to protest. Syria's allegations were confirmed by the Egyptian Military Attaché in Beirut, who defected and supplied the Saudis with a list of his Syrian agents. A. Nutting, Nasser (London: Constable, 1972) pp 313-15; Cahiers de L'Orient Contemporarian, 50 (1962), p. 391. 29. In September 1962, the Syrians sponsored the formation of an Egyptian government in exile. In the spring of 1963, a Nasserist radio station in Lebanon was blown up by Syrian agents and a network of Syrians uncovered in Tripoli; their task had been to assassinate a Syrian exile and to blow up a local government building. Cahiers de L'Orient Contemporarain, 50 (1962), p. 391; "Clandestine Radio Station Blown Up," Arab World, 8 February 1963; "Terror Gang," Arab World, 12 February 1963. 30. This process proceeded in parallel with the internal Ba'th party struggles, which gradually narrowed the party and regime's core of support. I. Rabinovich, Syria under the Ba'th 1963-1966 (Jerusalem: Israel Universities Press, 1972), pp. 124-25; J. Devlin, The Ba'th Party: A History from its Origins to 1966 (Stanford, CA: Hoover Institution Press, 1976), pp. 218-27. 31. N. Van Dam, The Struggle for Power in Syria (London: Croom Helm, 1979), p. 34; Cahiers de L'Orient Contemporarain, 54 (1964), pp. 96-98. 32. The military attaché in Nicosia, usually a Deuxième Bureau officer, was successful in recruiting several agents inside Israel. Caroz, The Arab Secret Service, pp. 295-99. 33. Cahiers de L'Orient Contemporarain, 55 (1964), pp. 264-65; Caroz, The Arab Secret Service, pp. 288-94. 34. Observers sympathetic to Fatah argue that the relationship was more equal than I suggest. See H. Cobban, The Palestinian Liberation Organisation (Cambridge, UK: Cambridge Middle East Library, 1984), pp. 32-35. However, in view of Fatah's lack of trained manpower and bases, it is probable that it acted at Syria's behest in the early days. Thomas Kiernan, Yasir Arafat, the Man and the Myth (London: Abacus, 1976), pp. 198-200; J. Becker, The PLO: The Rise and Fall of the PLO (London: Weidenfeld and Nicolson, 1984). 35. Jalal Ka'ush was one of these men. A native of the Upper Galilee, he had worked for Syria since 1949. He ran spy networks in Northern Israel and carried out terrorist attacks in the 1950s. In 1958, he led a fedayeen unit fighting with the Lebanese National Front. In 1965, he was captured by Lebanese forces while leading a Fatah unit. He "committed suicide" while under interrogation at the headquarters of the Lebanese Deuxième Bureau in February 1966. 36. Cobban, The Palestinian Liberation Organisation, p. 33. 37. For instance, in March 1965 the Israel Defence Forces attacked Syrian construction equipment near Tel al-Qadi. Cahiers de L'Orient Contemporarain, 57 (1965), pp. 33. 38. "Ruthless Tactics in the Struggle for Syria," Observer, 6 March 1966; P. Seale, Asad: The Struggle for the Middle East (London: I.B. Tauris, 1988), pp. 104-9. 39. Patrick Seale recounts several instances where torture was used against high officials opposed to Jadid. Seale, Asad: The Struggle for the Middle East, p. 114. 40. Seale, Asad: The Struggle for the Middle East, p. 115; M.H. Kerr, The Arab Cold War: Gamal 'Abd al-Nasir and his Rivals, 1958-1970 (London: Oxford University Press, 1971), pp. 126-27. 41. Brigadier General 'Ali Douba has been head of Military Intelligence since 1973, while Brigadier Muhammad al-Khuwali was director of Air Force Intelligence from 1963 to 1987. 42. For discussions of the nature of the regime, see H. Batatu, "Some Observations on the Social Roots of Syria's Ruling Military Group and the Causes for its Dominance," The Middle East Journal, 35, no. 3 (Summer 1981), pp. 331-44; M. Viorst, "The Shadow of Saladin," New Yorker, 8 January 1990, pp. 40-65. 43. For instance, Saiqa, which was responsible for numerous operations, is portrayed by Damascus as an independent Palestinian organization. In fact, one of Asad's first actions on coming to power was to curtail the group's independence and bring it within the regular Syrian military establishment. For a list of Saiqa operations, see Office of the Vice-President of the United States of America, Terrorist Group Profiles (Washington, DC: Government Publishing Office, 1988). For Asad's attitude to Saiqa, see Seale, Asad: The Struggle for the Middle East, p. 181. 44. For a survey of Syrian guerrilla and terrorist activity in the 1970s, see D. T. Pritchett, "The Syrian Strategy on Terrorism: 1971-1977," Conflict Quarterly, 8, no. 3 (Summer 1988), pp. 27-48. 45. Middle East Watch, Syria Unmasked: The Suppression of Human Rights by the Asad Regime, pp. 8-21. 46. US Defense Intelligence Agency, cable from US Defense Attaché, Damascus, 27 December 1977 (VZCZCML T259IL0805), released under the Freedom of Information Act. 47. This competition burst into the open in 1983-84 when Asad suffered a heart attack. A. Drysdale, "The Succession Question in Syria," Middle East Journal, 39, no. 2 (Spring 1985), pp. 246-57. 48. M. Ma'oz, "State Run Terrorism in the Middle East: The Case of Syria," Middle East Review, (Spring 1987), pp. 11-15. The US Department of State noted that, since 1983, Syrian services tended to work more through proxy terrorist groups, rather than exposing their own agents as was standard practice before. The Department estimated that Syrian supported terrorist attacks caused 500 casualties between 1983 and 1986. US Department of State, Syrian Support for International Terrorism: 1983-1986 (Washington, DC: Department of State, December 1986). 49. It was in 1948 that Husni al-Za'im's coup inaugurated the tradition of military involvement in politics. 50. Seale, Asad: The Struggle for the Middle East, pp. 150-53. 51. A notable instance was the trials that followed the assassination of Adnan al-Malki in 1955, which were used by the Ba'th Party's sympathizers in the Bureau to destroy their right-wing opponents. For a full account, see Rathmell, Secret War in the Middle East: The Covert Struggle for Syria 1949-1961, pp. 97-103. 52. For a recent assessment of the positions of the rival intelligence 'barons,' see J. Bruce, "Changes in the Syrian High Command," Jane's Intelligence Review, 7, no. 3 (March 1995), pp. 126-28. 53. An approach that may help to make explicit operating norms and values could be to apply concepts developed in the study of the anthropology of bureaucracy. See J. McC. Heyman, "Putting Power in the Anthropology of Bureaucracy," Current Anthropology, 36, no. 2 (April 1995), pp. 261-77. 54. Hinnebusch, Authoritarian Power and State Formation in Ba'thist Syria: Army, Party and Peasant, passim. 55. A version of this outline was published in Jane's Intelligence Review, 7, no. 3 (March 1995), p. 127. The sources for this description are Intelligence Newsletter, 13 September 1989, p. 8; 27 September 1989, p. 7; 25 October 1989, p. 7. US Defense Intelligence Agency, cable from US Defense Attaché, Damascus, 27 December 1977 (VZCZCML T259IL0805); US Defense Intelligence Agency, Department of Defense Intelligence Information Reports numbers: 6 891 0080 76, 6 891 0165 76, 6 891 0211 76, 6 891 0352 76, 6 891 0074 77, documents obtained under the FOIA; Seale, Asad: The Struggle for the Middle East; Caroz, The Arab Secret Service; Middle East Watch, Syria Unmasked; Amnesty International, Report to the Government of the Syrian Arab Republic; author's interviews with Israeli officials, British officials and Syrians. 56. The noted French scholar Michel Seurat even argued that Asad's regime had exported its "state terrorism to establish it as a new code of international relations." M. Seurat, L'État de Barbarie (Paris: Editions du Seuil, 1989), p. 91. 57. Z. Raad, King Hussein's Foreign Diplomacy: January 1956-December 1958 (Unpublished Ph.D. diss., Cambridge University, 1993), pp. 111-40; P.J. Vatikiotis, Politics and the Military in Jordan (London: Frank Cass, 1967), pp. 126-35. 58. In mid-1958, the Jordanian authorities broke up a bedu gang smuggling in arms through the Negev and uncovered a Syrian-backed terrorist cell. For accounts, see PRO, FO 371/134009/VJ1015/74, Johnston to FO, 13 August 1958, and 134010/VJ1015/82, Johnston to FO, 21 August 1958. 59. The most dramatic event was the March 1959 Mosul revolt in which anti-Qasim rebels were aided, if inadequately, by Syrian intelligence operatives. Mahmud al-Durrah, "'Thawrat' al-Mawsil ba'd sab' sanawat (The Mosul 'revolution' after seven years)," Arab Studies, no. 6 (April 1966), pp. 46-59; H. Batatu, The Old Social Classes and the Revolutionary Movements of Iraq (Princeton, NJ: Princeton University Press, 1978), pp. 866-89. 60. Amman Radio, 25 May 1960, BBC Summary of World Broadcasts (hereafter SWB) Part IV, no. 344, 27 May 1960. 61. Amman Radio, 26 June 1960, SWB Part IV, no. 370, 28 June 1960. 62. Johnston advised him against such a precipitate move. PRO, FO 371/151041/VJ1015/13, Johnston to FO, 26 March 1960; VJ1015/15, Johnston to FO, 31 March 1960; 151042/VJ1015/18, Figg to FO, 2 April 1960; VJ1015/23, Morris to Beith, 6 May 1960. 63. King Hussein, Uneasy Lies the Head (London: Heinemann, 1962), pp. 187-94; P. Snow, Hussein: A Biography (London: Barrie and Jenkins, 1972), p. 134; C. Johnston, The Brink of Jordan (London: Hamish Hamilton, 1972), p. 153. 64. Amman Radio, 26 June 1960, SWB Part IV, no. 370, 28 June 1960. 65. PRO, FO 371/151047/VJ1015/91, Johnston to the Earl of Home, 1 September 1960. 66. Johnston initially put the number of injured at 85, but the Jordanian prosecutor subsequently reported the figure of 41. PRO, FO 371/151053/VJ1015/195, Amman to FO, 15 November 1960. See also "51 shahidan wa jarihan fi infijarayn ghadirayn," Al-Difa', 30 August 1960. 67. An Israeli source claims that the attack was organized by a Syrian Intelligence officer named Colonel Fuad Serag al-Din. However, Adham is mentioned in Jordanian and British sources. C. Herzog, The Arab-Israeli Wars (Bath, UK: Book Club Associates, 1982), pp. 145-46. 68. J. Lunt, Hussein of Jordan: A Political Biography (London: Macmillan, 1989), p. 61. 69. PRO, FO 371/151044/VJ1015/57, Johnston to FO, 30 August 1960; 151041/VJ1015/67, Johnston to FO, 31 August 1960; 151049/VJ1015/147, Amman to FO, 16 September 1960; 151053/VJ1015/195, Amman to FO, 15 November 1960; 151054/VJ1015/208, Henniker-Major to Beith, 9 December 1960; VJ1015/214, Henniker-Major to Beith, 20 December 1960; S. Musa, A'lam min al-Urdunn (Outstanding Personalities from Jordan) (Amman: Dar al-sha'b, 1986), pp. 36-46. 70. PRO, FO 371/151041/VJ1015/72, Minute "UAR Press and Radio Commentary on the assassination of the Prime Minister of Jordan," 2 September 1960. 71. PRO, FO 371/151041/VJ1015/70/G, Wright to FO, 1 September 1960. 72. PRO, FO 371/151046/VJ1015/89, Johnston to FO, 9 September 1960. 73. PRO, FO 371/151044/VJ1015/58, Johnston to FO, 30 August 1960; 151046/VJ1015/89, Johnston to FO, 9 September 1960. 74. Johnston speculated that these advisers may have been feeding the King exaggerated accounts of the plots against him, and of Syrian troop movements, in order to push him to act. PRO, FO 371/151041/VJ1015/90, Johnston to FO, 9 September 1960. 75. PRO, FO 371/151041/VJ1015/90, Johnston to FO, 9 September 1960. 76. PRO, FO 371/151047/VJ1015/102, Johnston to FO, 10 September 1960. 77. PRO, FO 371/151048/VJ1015/113, Johnston to FO, 12 September 1960. 78. PRO, FO 371/151049/VJ1015/140, Minute "Jordan," 16 September 1960. 79. Details of this campaign are from Bulletin de la Presse Syrienne, nos. 1257, 1258, 1261, 1262, 1263, 1264, 1266, 1267, 1274, all Rubrique III and no. 1267, Rubrique IV; "Abd al-Nasser wa-Muhammad Dhahir Shah yakhtuban fi al-mu'tamar al-sha'bi," Al-Wahda, 26 October 1960; "Al-nass al-kamil li-qarar al-ittiham fi qadiyat Muhammad al-Fadl," Sawt al-Arab, 19 November 1960; "Mu'amarah Urdunniyah bi-Dimashq," Al-Ayam, 1 December 1960. 80. Shishakli was the brother of former Syrian President Adib al-Shisakli who had been ousted in a coup in 1954 partly backed by the Ba'th. 81. "Isti'naf al-tahqiq ma' shabakat Salah al-Shishakli," Al-Wahda, 28 November 1960. 82. Bulletin de la Presse Syrienne, nos. 1273, 1274, 1275, Rubrique III; Amman Radio, 20 December 1960, SWB Part IV, no. 521, 22 December 1960; Voice of the Arabs, 2 January 1961, SWB Part IV, no. 530, 4 January 1961. 83. Bulletin de la Presse Syrienne, nos. 1278, 1279, Rubrique III. 84. Bulletin de la Presse Syrienne, nos. 1281, 1282, Rubrique III; Cahiers de L'Orient Contemporain, 45 (1961), p. 48; Chronology, Middle East Journal, 15, no. 1 (Winter 1961), p. 66. 85. PRO, FO 371/157526/EJ103116/1, Morris to O'Regan, 24 February 1961; EJ103116/5, Cairo to FO, 3 March 1961; EJ103116/7, Henniker-Major to FO, 13 March 1961; EJ103116/11, Cairo to FO, 14 March 1961. 86. PRO, FO 371/157526/EJ103116/20, Henniker-Major to FO, 29 March 1961; 157527/EJ103116/22, Beeley to FO, 31 March 1961. Nasser was motivated largely by his need to placate the pro-Western Arab regimes in order to isolate the Iraqi President, 'Abd al-Karim Qasim. The rapprochement went further when in July UAR troops cooperated with Jordanian and Saudi forces as part of an Arab League force defending Kuwait from Qasim's irredentist claims. Kerr, The Arab Cold War: Gamal 'Abd Al-Nasir and his Rivals, 1958-1970, pp. 1-25. On the Kuwait incident, see M. Khadduri, Republican Iraq (London: Oxford University Press/RIIA, 1969), pp. 166-72. 87. D. Pipes, "Why Asad's terror works and Qadhafi's doesn't," ORBIS, 33, no. 4 (Fall 1989), pp. 501-8. 88. See my attempts to do the same for Libya and Iraq. Andrew Rathmell, "Libya's Intelligence and Security Services," International Defense Review, (July 1991), and "Iraqi Intelligence and Security Services," International Defense Review, (May 1991). 89. For a preliminary assessment of the documents, see Middle East Watch, Bureaucracy of Repression. Hanna Batatu produced his comprehensive account of Iraqi politics and society in part by using British intelligence and police reports which he found invaluable, but the Middle East Watch collection is nowhere near as comprehensive. The full story of the Arab world's police states is unlikely ever to be told. Even though vast quantities of documents survived the fall of the Nazi regime in Germany, our knowledge of the inner workings of Hitler's intelligence services remains only partial. See D. Kahn, Hitler's Spies (New York: Macmillan, 1978).